WNET realized it was in need of a full-lifecycle software that could support all HR and financial management needs, in a unified system. The solution was found in Workday and Collaborative Solutions. The WNET family of companies is a major producer of broadcast and online media for local and national audiences. Headquartered in New York City, WNET is a pioneer in educational programming, bringing quality arts, education, and public affairs programming to over 5 million viewers each week and producing acclaimed PBS series, documentaries, children’s programs, and local news and cultural offerings. In addition to its programming, WNET provides tools for educators to bring compelling content to life in the classroom and at home. 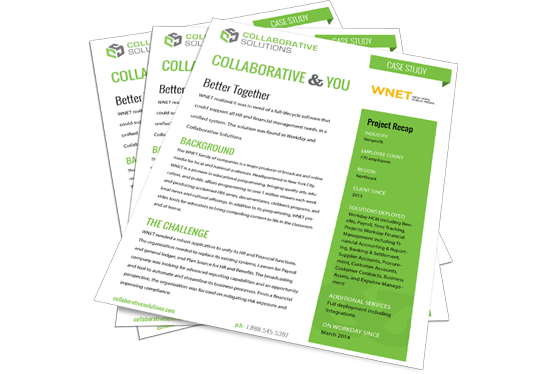 WNET needed a robust application to unify its HR and Financial functions. The organization needed to replace its existing systems, Lawson for Payroll and general ledger, and Plan Source for HR and Benefits. The broadcasting company was looking for advanced reporting capabilities and an opportunity and tool to automate and streamline its business processes. From a financial perspective, the organization was focused on mitigating risk exposure and improving compliance. WNET chose Workday as their new HR and Financial transformation system, and selected Collaborative Solutions to lead the phased deployment. Phase 1 included Workday HCM, Benefits, Payroll, Time Tracking, Projects, and integrations to 3rd party systems. It went live in March 2014 after seven months. WNET decided to deploy Workday Financial Management as a Phase 2 project, which included Financial Accounting & Reporting, Banking & Settlement, Supplier Accounts, Procurement, Customer Accounts, Customer Contracts, Business Assets, and Expense Management. This went live after 12 months in July 2015. WNET’s Workday deployment unifies the entire organization with the integrated deployment of a full set of Workday capabilities. In addition, with Workday, WNET is able to meet its goals to restructure and systematize business processes, and refine reporting abilities. All HR and Financial functions can be performed on the easy-to-use software, now with mobile capabilities. In addition, WNET is realizing increased employee productivity and the benefits of having its team have access to real-time data. WNET realized it was in need of a full-lifecycle software that could support all HR and financial management needs, in a unified system.